This Saturday, June 9th, 2012 will see the downtown core once again regaled in rainbows and the scantily clad gay community as Edmonton once again goes through Pride Week. This is the annual festival where the LGBTQlmnop community celebrates their equality. Wait a minute… This is the week when the LGBTQlmnop community proves that, through no fault of the rest of the community as a whole, they are not equal. Indeed, this is the week where the gay community ensures they remain “Special” and, therefore, not equal. Special and equal exist in two completely different spectrums. The problem here is the gay community is not the one with the agenda. The question I want answered is why they are allowing themselves to be used and abused by the MEDIA. A friend said today, “Puppy dogs and butterflies do not sell newspapers. Collisions and catastrophe sell newspapers.” Well neither do Pink Fluffy Unicorns or Rainbows. [embedyt]http://www.youtube.com/watch?v=eWM2joNb9NE[/embedyt] So Alison Redford decides to attend the Gay Pride festivities. Great! But why? 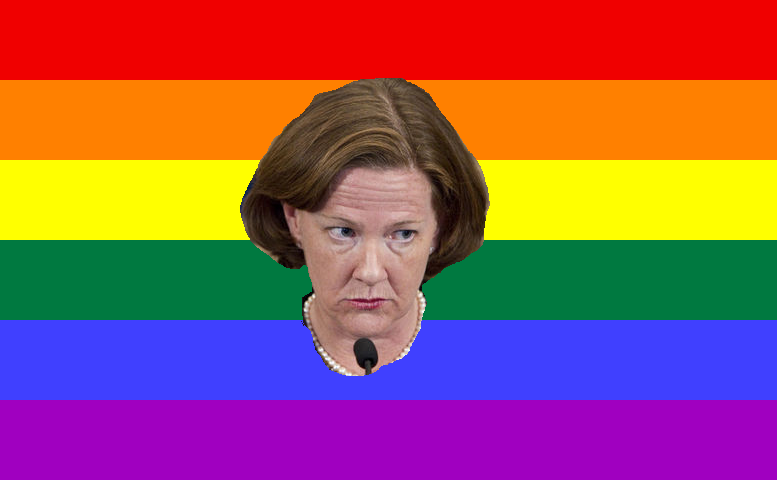 There is only one reason for Alison Redford to attend the Gay Pride parade. If she attends she can keep up her silly, childish antics of calling the Wildrose Party names in the legislature. But, Alison, that boat won’t float. Danielle Smith, with the blessing of the Wildrose Party, will be attending the festivities. What does this do to Alison’s motivations for attending the parade? No longer will the media have a story. With representation from all four parties, the LGBTQlmnop community is now EQUAL. Equality does not sell newspapers. They were better off, and more SPECIAL, with only Laurie Blakeman representing her “FABULOUS” constituency. Wake up people!! Don’t the organizers of the Pride Festival realize they are being played? They are being played by the media. They are the train wreck the media needs. If Alison attends the festivities and Danielle does not the media has a story about the homophobic Wildrose Party. Since the media is the driving force behind the fallacy of Wildrose Homophobia, the only people who benefit from Danielle not attending is the MEDIA. The only people who benefit from Alison attending are the media. The Gay Community will survive, have their parade and celebrate whatever it is that makes them more equal with or without the premier, the leader of the opposition or Brian Mason taking up space in their parade. Alison, a leader who picks and chooses which communities to support, already, at Chanukah, shunned the Edmonton Jewish community by being the first premier of Alberta NOT to have attended the lighting of the public Menorah at the LEGISLATURE, though I hear she attended in Calgary (Does she hate Edmonton? 😉 ). Now, she chooses to be the first premier to attend a Gay Pride event in this province. I guess we now know where this premier’s intentions lie. If church and state are supposed to be separated, why is this Premier so blatantly giving the proverbial finger to all the people whose faith doctrines don’t agree with the Gay lifestyle while, at the same time, thumbing her nose to the Jewish community at an event ALWAYS attended by the premier? In the name of equality, Alison should NOT attend the Menorah lighting. There should be no Christian, Muslim, Jewish, or any other religious insignia or celebrations at or mentioned by the legislative assembly. At the same time, Alison should not be attending events that imply one group or another is more or less equal than any other group. In order to not offend, it should be accepted that all are equal, Christian, Jew, Muslim, Atheist, Liberal Secularist (yes it has become a religion, just ask @Kikkiplanet), Gay, Straight, or whatever. To further not offend, no political leader should attend these events, support one viewpoint over another, or in any way lesson one set of beliefs over another. The Premier of Alberta by attending this event insults, not only Christians, Jews, Muslims, but Homosexuals themselves. The premier, by attending this event uses the Gay Community to further her own political agenda, and by doing so baptizes the gay community into forever being unequal in the eyes of the community as a whole. She does this, not out of a love for queers. She does this not out of hatred for persons of faith. She does this with one goal in mind, political gain, nothing more. I beg the Gay Community to not only reject this media driven agenda, but open their eyes and see the motivation of, not only Alison, but the other political attendees, save, perhaps, Laurie Blakeman, and deny each of them their pulpit. Why not allow these partisan battles to occur without being the pawns for those who are are too cowardly to just say what they really think? I would be offended if Alison, Danielle, Brian or, indeed, Laurie decided to make me their poster minority of the week. It is no secret that I have not been a supporter of the Gay Community. However, I have always stood up for the rights of people with differing belief systems to co-exist and freely express themselves. As such, it perturbs me to witness the leaders of this province using one group over another when doing so serves only to disenfranchise and pit one belief system against another with an uncertain, but certainly negative outcome. Our leaders, the government, the official opposition, the NDP etc., have no business making their political gains at our expense. In order to do so they have to publicly declare that one belief system is superior to another. What happens then? Simple, they are effectively stating that one group has rights while another group does not. Is that the kind of equality Blacks, gays or women have been fighting for? I think not! Rumours abound at the seat of government about the moral values of this premier. Does a community starving for acceptance, tirelessly expounding upon their belief in monogamous long-term relationships, really want to sully their image by inviting her presence at their events? Though I am unable to attend the Pride Parade, as I will be poking a beaver (get your minds out of the gutter, I will be destroying a dam and hunting a rodent), it would be nice to think that, though I am not a huge fan, this group could have a good celebration of their beliefs without political interference by our government, or their media masters. Say no to the media creating stories where really none exist. Happy Pride! Didn’t she attend the similar lighting in Calgary, that I always remember Klein going to as Premier? I would guess under Stelmach the night of the big public event in Edmonton was switched to be simultaneous with the Calgary event which precludes the Premier from going to both. If Klein somehow went to both simultaneously, I have other questions, like where did he find a DElorean! Perhaps, but in Edmonton it is at the LEGISLATURE. Attended by the PREMIER, until last year. Well.Que sera.It’s actually quite hethaly in retrospect. As I’ve blogged, the party needs to clearly (IMHO) brand itself as a fiscal conservative, libertarian party – as opposed to a socially conservative party.And sometimes the best lessons are the hardest ones.The good news as well – as irritated as I am with the new Premier, I take solice that I’m not in Quebec, where, apparently you riot in the streets when the government suggests you pay tuition lower than almost every other Province in Canada.So. No biggy. I mean, it doesn’t seem that long ago that Stockwell Day was taking his lumps federally, does it? LOL.. have a good one mes amis!